Today was a “Grey Day” for me. Grey days are when there are a lot of clouds in the sky, no rain and everything seems dark. Days like these, all I want to do is sleep. On days like these, no amount of coffee will wake me up and there is a feeling of heaviness in the air. Because of the grey day, I decided that things needed to be spice up. 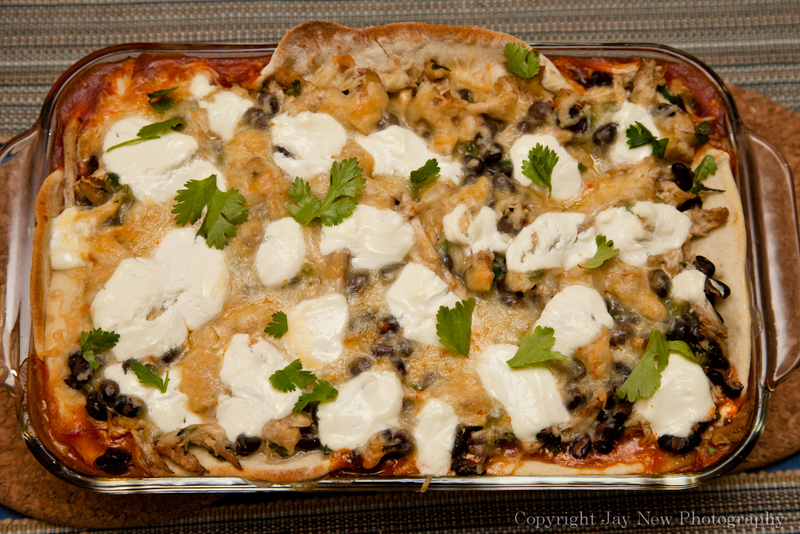 I have not made any Mexican styled foods in a while and I think that is exactly what we need! For this recipe, I decided to go with canned enchilada sauce but I will be sharing later, a good enchilada sauce recipe. I made my homemade tortillas (you can certainly make your own) which as so easy to make! I learned how to make them while I was living in Belize. I remember my roommate and I taking study breaks to snack on fresh tortillas. Spread half the enchilada sauce on the bottom of your baking dish and place 4 tortillas (overlapping) over it. Spoon half the chicken mixture over the tortillas and then half the cheese and dot on half the sour cream. When dealing with jalapeno, I highly suggest you wear gloves. You can easily get disposable gloves at any store. If you do not want the major heat from the jalapeno, remove the seeds and inner membranes. This is where most of the heat is located. As always, you can increase or reduce the amount of jalapeno in this recipe to your taste. For those with gluten sensitivity, not all corn tortillas are gluten-free. Be careful! However, I have some good news for you. They are super easy to make! Just make sure that the Masa Harina (corn flour found in the Spanish aisle) by reading the ingredients (in case they try to sneak some gluten in). Normally, it is just made with cooked whole grains of corn that are ground and dried. Divide dough into 15 equal sized balls and using your hands, rolling-pin or press, roll ball of dough flat between two plastic wrap sheets. Place tortilla on heated pan and cook until browned both sides.